From Asia and the Middle East, to Europe and the Americas, the food we eat each day is changing, and our behaviours, desires and needs are constantly evolving. Which products make the Chinese salivate? What makes Qataris, Malaysians or Spaniards buy one food product and not another? In which countries is zero waste important? Where does most of our food production come from? Which guarantees reassure Asians or Europeans the most? Carried out in 9 European countries, in North America, in the Middle East and in Asia, this analysis of supply and demand sheds new light on topics such as the differences between Asian and North American health innovations, or what organic produce means to the Germans and the French. Retailers and manufacturers surf the latest food trends to satisfy the sometimes surprising tastes of consumers. And, by the way, are local products as important the world over? See the entirety of the video at official YouTube channel of SIAL Paris (French only). Do consumers behave the same way across the world? What are their limits and their expectations? Are they open to innovation in the same way? 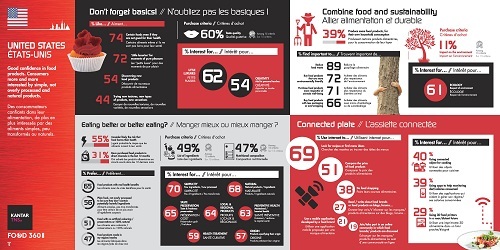 Third part of the FOOD 360 Study realized by KANTAR TNS in link with the XTC Book of Food Trends FutureFood. It covers nine countries in Europe, in the USA, in the Middle-East and in Asia. Consumers seeking pleasure and natural/organic products. High sensitivity for sustainable food. Limited interest in Food Tech. The innovative offering in Germany is built on the PLEASURE axis, with a substantial share falling under the VARIETY OF SENSES trend (39,7%) and the HEALTH axis, which represents almost one in three new products. Also worth noting is the strong showing of the NATURAL trend, on 2nd rank with 19,9% of the innovative offering. It is due primarily to the dynamic German organic food market. High sensitivity to the link between food and health, as well as for healthy products. A strong interest for sustainable food and home-grown products. Already strongly committed online when it comes to food. Concern about the impact of food on their health. Consumers looking for regional products, authenticity or top of the range products. High online commitment when it comes to food. In Asia, the PLEASURE axis represents 55% of the food innovation offering, accounting for more than one in two innovations launched in Asia. The VARIETY OF SENSES and SOPHISTICATION trends are driving the PLEASURE axis. The HEALTH axis made significant gains as did the CONVENIENCE axis. Innovation is diversifying. The NATURAL trend now accounts for 6.9% of innovations in 2015. A new Natural offer is emerging: using “super-ingredients” or 100% natural ingredients, and further developing the certified organic offering. The PHYSICAL axis regressed and the ETHICS axis remains marginal. A holistic approach to food, mixing interest for pleasure, new sensations and health benefits. Strong online engagement when it comes to food. Of all European countries, Spain had the poorest showing in the PLEASURE axis. However, it still accounts for one in two innovations launched: VARIETY OF SENSES is top leader with 30,1%. Innovation in the HEALTH axis is vibrant and represents almost one quarter of the country’s food innovation in 2015. It is based mostly on MEDICAL trend. Good confidence in food products. Consumers more and more interested by simple, not overly processed and natural products. In North America, the innovative offering has remained stable year over year and is focused on the PLEASURE and HEALTH axes. Note that the HEALTH offering is proportionally strongest (37% in 2015 for North America vs 23.3% for the World). It is also worth noting the weak representation of the PLEASURE axis. North America’s innovative offering is being driven by the NATURAL trend, which has continued its ascent (21.7% of the innovative offering in 2015) to become the year’s second most represented trend. Note that new innovation levers positioned around the NATURAL trend are continuously emerging in North America—superfoods, new diets such as the paleo diet, new natural ingredients. The SOPHISTICATION trend lost steam (down 0.9 points between 2014 and 2015), which only underscores the key role the VARIETY OF SENSES trend plays in building the PLEASURE-oriented innovative offering in North America (27% of the offering in 2015). 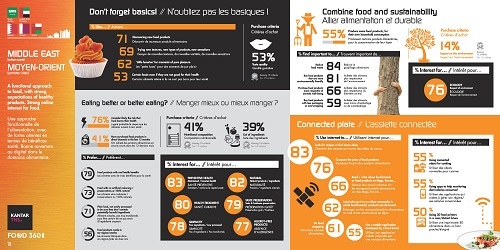 A functional approach to food, with strong expectations of healthy products. Strong online interest for food. gluten-free, lactose-free, vitamin-enriched, or “clean label” products. While imports still hold a significant share of the market, local businesses are innovating on an increasing scale. 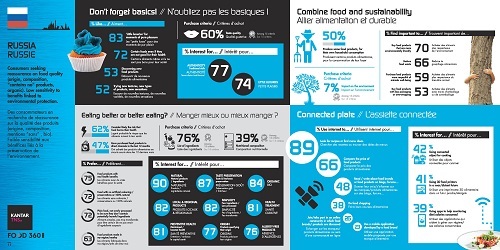 A positive perception of their diet and the available food products. Strong interest for new products and variety. Consumers seeking reassurance on food quality (origin, composition, "contains no" products, organic). Low sensitivity to benefits linked to environmental protection. In Russia, the innovative offering is built on the PLEASURE axis (53,4%), with VARIETY OF SENSES and SOPHISTICATION trends. Also worth noting is the strong showing of the CONVENIENCE axis, on 2nd rank, innovation is centered around the benefits of the EASY TO HANDLE aspect. 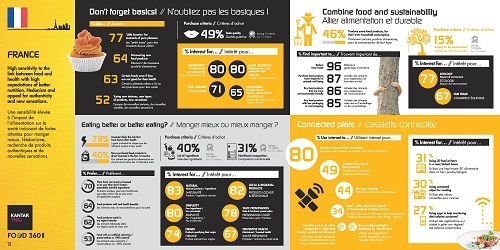 The exclusive study KANTAR TNS Food 360 for SIAL highlights 3 distinctive points about French consumers. pleasure and treating one’s self. And so in 2016, 77% of French people enjoyed indulging in food products deemed as little luxuries. However, this figure is 5 pts lower than in 2012. France is the only country (along with Russia) where this figure has dropped. Also, the proportion of French people prepared to pay more for value-added foods has dropped from 70% to 65% (between 2012 and 2016) - a sign that people are tightening their belts on both expenditure and their choice of foods. In 2016, 79% of French people considered it probable that food harms their health (+ 20 points more than in 2014). Whether justified or not, this way of thinking has led them to both pay more attention to the information that help them to have guarantee of better quality (provenance, place of manufacture, “No labels” on the packaging, organic products…) and change their way of getting food (favouring local produce and short distribution channels, home-growing some of their own food…). When it comes to online behaviour, the French are no more or no less advanced than their European or American counterparts. However, they lag behind Asians and Middle Easterners who readily use the Internet for food purchases or to interact about brands. Good news for innovations in Food tech or online services for food brands! France is one of the most innovative countries when it comes to food… Along with the USA, China, the United Kingdom and Japan. Food culture is very strong. The omnipresence of SMEs/very small enterprises (98% of agricultural & food industries): they have to innovate in order to stand out from the major groups and justify their shelf space. More than anywhere else in the world, French distributors encourage very small enterprises to innovate. There’s also a craze for FoodTech with multiple innovative food start-ups. France is a real incubator. Its innovation is high-end, infused with a culture for taste. It’s in France that sophisticated food is most cherished. Its “health” innovation is (like in other countries) important, but its culture means that France has chosen to play the “naturalness” card (as opposed to the “medical” card), and other countries, including the USA, are now following suit. Its innovation knows how to combine gastronomy and modernity. R&D isn’t afraid to make bold innovations as they have great traditional, gourmet references upon which to base themselves.